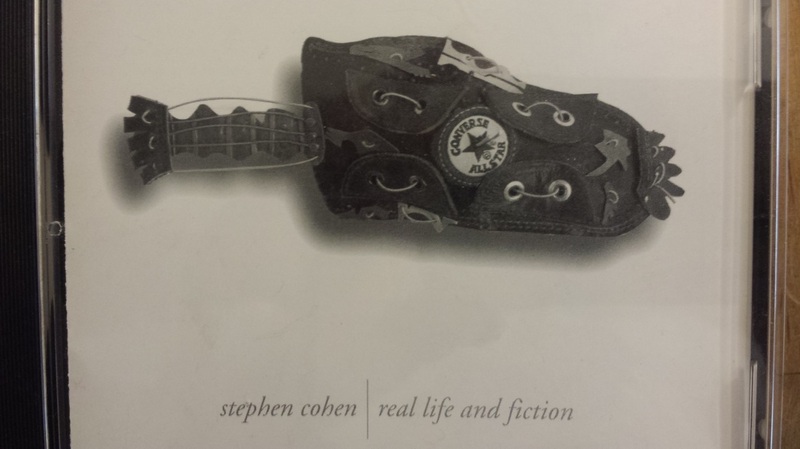 Stephen Cohen started playing guitar as a teenager in his attic room in Pawtucket, Rhode Island. He attended Brandeis University in Massachusetts for 3 years and then left school, guitar in hand, to hitchhike across the United States. After many adventures along the way, including living in a tree house in the mountains, living in geodesic domes and makeshift shacks in several communes, working as a movie extra in New Mexico, working with autistic children in Philadelphia, living and performing at coffee houses and restaurants in and around Santa Fe, New Mexico, and becoming a father to 2 sons, Stephen arrived in Eugene, Oregon and stayed there for 18 years. He went back to school at the University of Oregon and received a bachelors degree in art. 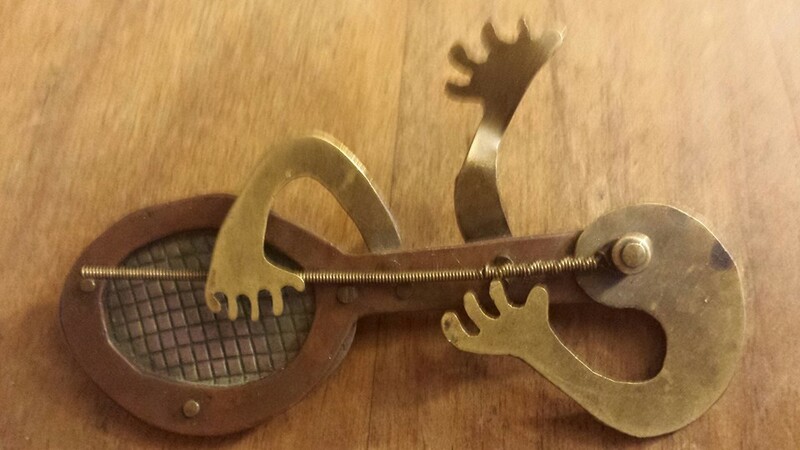 He made music themed, unique jewelry pieces which he sold at galleries and art shows. He performed at music venues, concerts and festivals in the area and formed his first band, the Tree People, with local musicians. 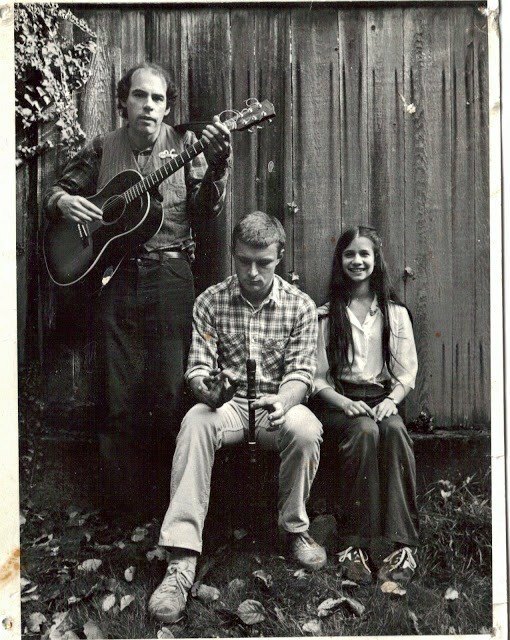 Stephen recorded his first album, The Tree People, in 1979, in a studio in the woods near Eugene. Stephen wrote Yes, I'm Walking during his travels as a young man. Running Falls, from 3 String Stephen Plays Cigar Box Guitar, Above is his most recent version of the song on cigar box guitar. 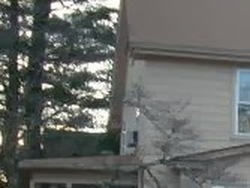 is about Stephen's childhood home in Pawtucket, Rhode Island. 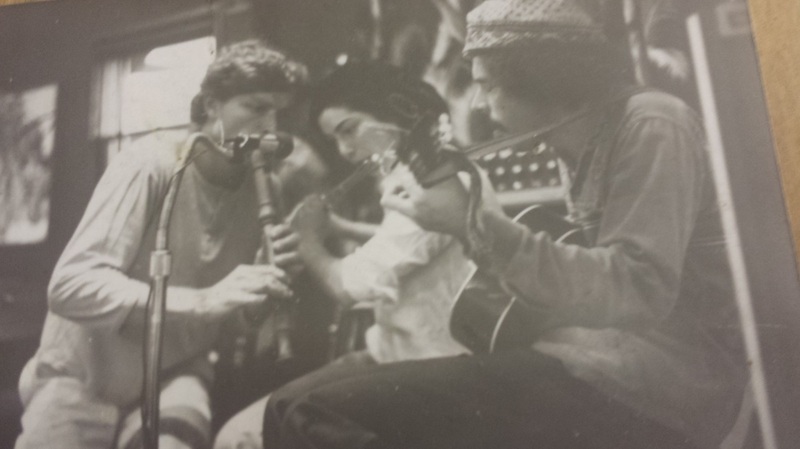 Early days (1979) of the Tree People in Eugene Oregon: Stephen on acoustic guitar, Rachel Laderman on flute, Jeff Stier on recorder. 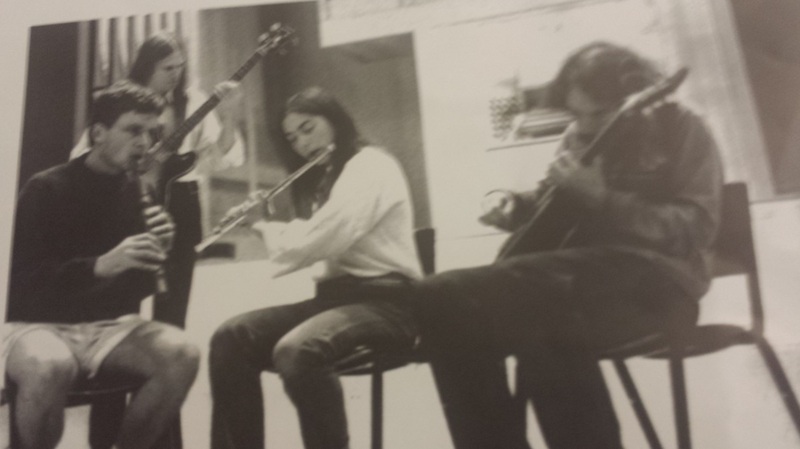 Jeff on recorder, James on bass, Rachel on flute, Stephen on guitar. 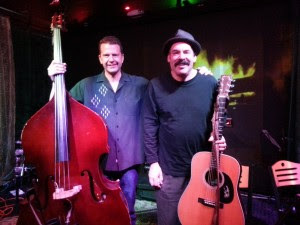 Soon after he arrived in Eugene, Stephen started performing regularly at the Home Fried Truckstop, a restaurant/music venue close to the University of Oregon campus that featured live music daily. It was there that Stephen met Jeff Stier, a local musician who played recorder and all sorts of interesting percussion instruments, and the Tree People came into being. Rachel Laderman, a student at the University of Oregon and daughter of composer Ezra Laderman, joined them on flute. 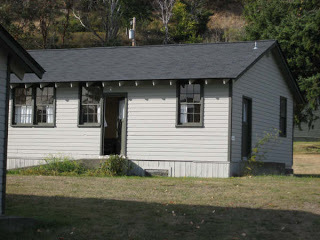 After many rehearsals, and many performances at local coffee houses, concert venues and festivals, Stephen scheduled a recording session at Rockin' A Ranch, a studio in the woods near Eugene. James Thornbury, a local blues-man (who later would join Canned Heat and who now lives in Australia) joined the 3 Tree People on electric bass on a few pieces and on backup vocals and slide guitar on Bring in the Water. Stephen has memories of nothing but music, afternoon and night, warm homemade cookies, good company, breakfast in the morning, and more music the next day. The Tree People was recorded, mostly live and on first takes, in one summer weekend. 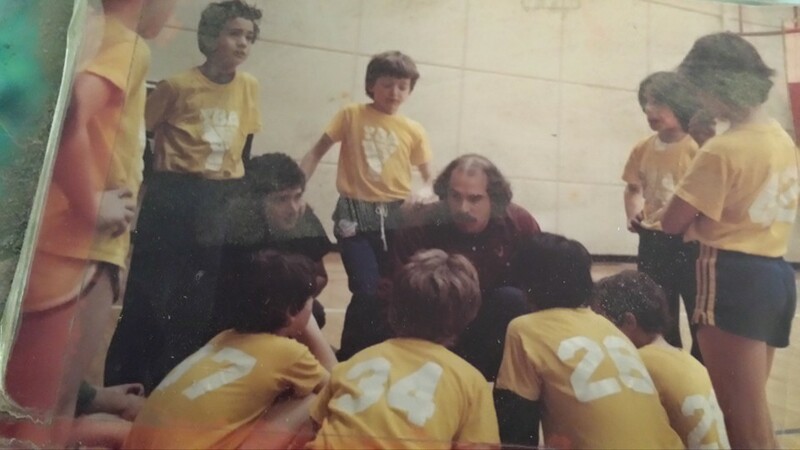 Stephen coaching his son Oryx's 5th grade basketball team. 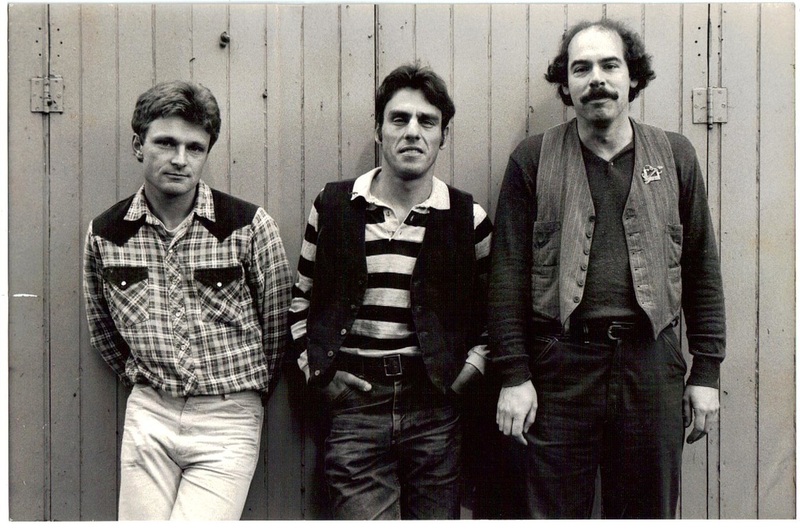 Stephen and Jeff with guest pianist Soria Meadow in the early 1980's. Soon after the first album was released, Rachel finished her studies at the university and moved to back to the East Coast, to work in Wood's Hole, Massachusetts. Jeff, always a fast learner, learned to play the flute and added it to his collection of instruments, and the Tree People continued with Stephen and Jeff, along with guest musicians at times. The young pianist Soria Meadow, whose mother was a fan of the Tree People, played with them in several concerts, including one at the Eugene Garden Club. Drummer Dennis Mochary joined the band, and played on several pieces on their 1984 album, Human Voices, including the song Thomas, which also featured Stephen's brother Jeremy (a freelance Berkeley, California musician) on electric bass. Because both Stephen and Jeff worked at a variety of other jobs during their times in Eugene, and because Stephen was raising 2 young children, the Tree People never toured, but kept busy performing at every possible place that one could in the Eugene area, including the Saturday Market, the W.O.W. Hall, the Harvest Festival, the Loft, the Homefried Truckstop, the 5th Street Market, the Eugene Celebration, the Oregon Country Fair, the Maude Kerns Art Center, the University of Oregon, and numerous other concert venues, art galleries, festivals and events. After 7 years of performing, the Tree People disbanded when Jeff took a job in Washington D.C. with congressman Peter DeFazio. Stephen continued to play music and create art, and he created a sculptural percussion instrument that he added to his act. He held weekly "big music" sessions at the Child Center, a treatment center for emotionally disturbed and at risk children in Springfield, Oregon, where he developed some of the songs and music that he features in his family and children's performances. His sons played basketball, baseball and golf, grew up and left for college. Stephen met Kate, who was the singer in a local rock band at the time. They got married at a community center in a creative wedding with lots of music, and then moved together to the nearest "big city", Portland. 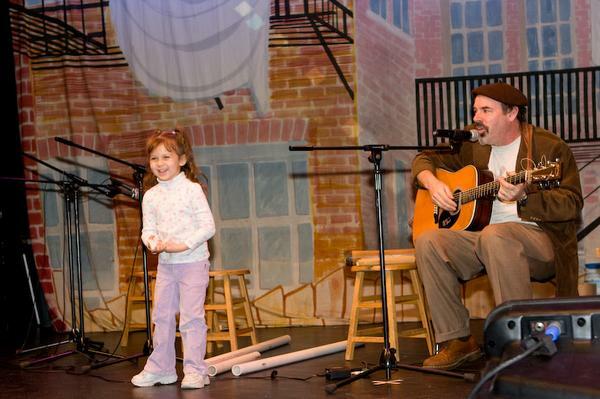 Stephen with audience participant at the Long Island Children's Museum. photo by Ben Sussman. 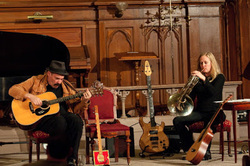 After moving to Portland, Stephen shared his music and art locally, regionally and nationally. He recorded and released a solo album in 2000, real life and fiction. 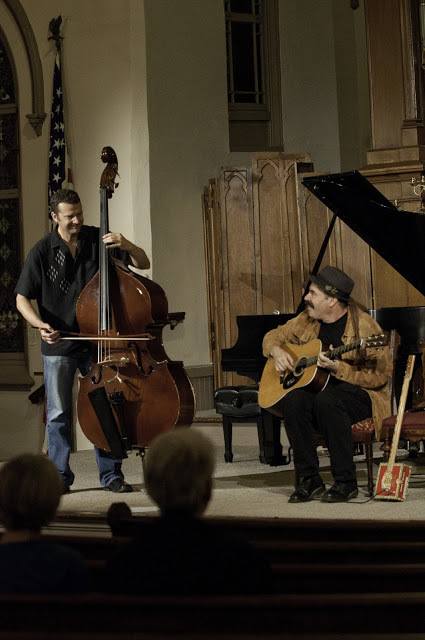 Stephen won national songwriting and lyricist awards for 2 songs on the album, Thomas, and Let's All Root for the Home Team, including an award at the Kerrville Folk Festival in Texas. This is a Test and Let's All Root for the Home Team, from real life and fiction, were released in a 7" inch vinyl single by Ethbo Music of London. Stephen performed at the Philadelphia Folk Festival in 2008. He did countless performances, workshops and residencies in the Portland area over the years, including a series of a residencies at schools, community centers and social agencies where he assisted students in creating instruments using recycled materials and found objects, composing music, writing songs and producing CDs and videos of the results. He did two such residencies, one of which was featured in the Oregon Public Television program Art Beat, at Wilsonville High School. He received a national grant from the Puffin Foundation, as well as a grant from the Regional Arts and Culture Council for another such residency at P:EAR, an agency working with street youth. 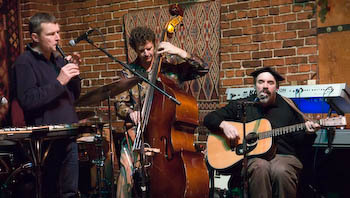 Stephen produced two Rain Songs concerts in Portland, where he and local musicians performed songs and music about rain. Stephen premiered his one song CD Bridges of This Town, at a landing overlooking some of Portland's many bridges. 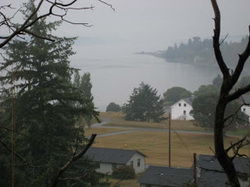 The lyrics were published in Sharon Wood Wortman's The Portland Bridge Book, and Stephen performed the song many times over the years at Sharon's bridge walks, tours, and events. 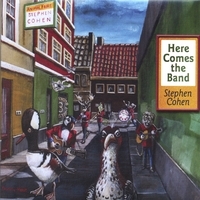 Stephen's 2006 nationally acclaimed children's and family album, Here Comes the Band, features 14 songs and a booklet with lyrics, stories about each song, activities, instrument making instructions and paintings and drawings by artist Christopher Shotola-Hardt. 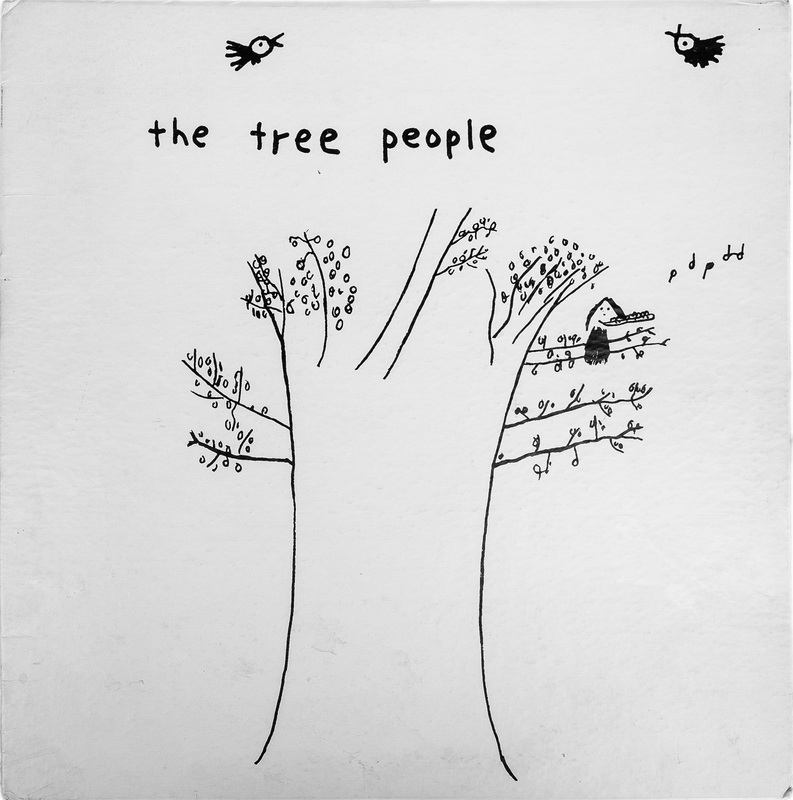 Stephen's drawing, which became the cover for the Tree People album. Meanwhile, the first Tree People album, originally released in vinyl and sold only in performances and at record stores in Eugene, Oregon, somehow appeared across the ocean, discovered twenty-five years after it was first recorded. Stephen, to his surprise, started receiving e-mails from record collectors around the world who were interested in purchasing the album. He had less than 100 copies left from the original 1000, and most of those were soon gone. Stephen placed some copies at Jackpot Records in Portland, and after those quickly sold out, Jackpot Records offered to reissue the album, but that deal fell through when only the master tape for one side could be found despite repeated basement searches. Fortunately a record collector from Seattle had bought a few copies and sent one to Johan Wellens of Tiliqua Records in Japan, who contacted Stephen and offered to take on the project. An excellent digital copy was made from the original vinyl and The Tree People was reissued as a limited edition CD to much critical acclaim. Stephen was then contacted by Antoni Gorgues of Guerssen Records of Spain, leading to a vinyl reissue of the album. Guerssen Records then reissued the second Tree People album, Human Voices, in vinyl and CD formats. 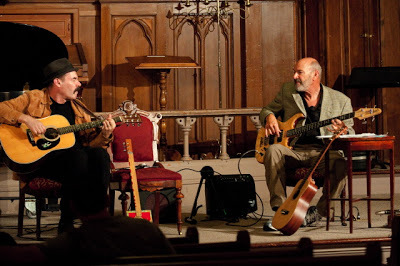 Stephen's solo acoustic guitar piece from The Tree People, No More School, was included in the acoustic guitar compilation Wayfaring Strangers, Guitar Soli, by the Numero Group of Chicago. The Tree People, whose music was hard to classify the first time around, were now being called "Fathers of Freak Folk" and "Psych Folk Pioneers" in enthusiastic reviews from around the globe. At the same time that the Tree People were being discovered worldwide, Jeff had moved back to Oregon to Lake Oswego, just a short drive from Stephen's southeast Portland home. They started playing music together again, added a 3rd member, Seattle musician Rich Hinrichsen on double bass and did a series of concerts in the Pacific Northwest, including performances at the White Eagle and the Mississippi Studios in Portland, the Matrix in Chehalis Washington, the Upstage in Port Townsend, Washington, and the Northwest Folklife Festival and the Arts in Nature Festival in Seattle. They did songs from the first two Tree People albums along with new material. They went back into the studio and put some new songs online. When Antoni of Guerssen Records heard some of the new material he decided to commission his label's first non reissue album, and It's My Story was then released in vinyl and CD editions by Guerssen Records in 2010. Living with the Animals featured guest appearances by Stephen and Kate's dogs and vocalist Nicole Campbell. The Tree People did an album release concert at the Old Church in Portland (with Nicole as a guest vocalist but no dogs). It was the last time with the Tree People this time around for Jeff, who retired from the performing life after that concert. 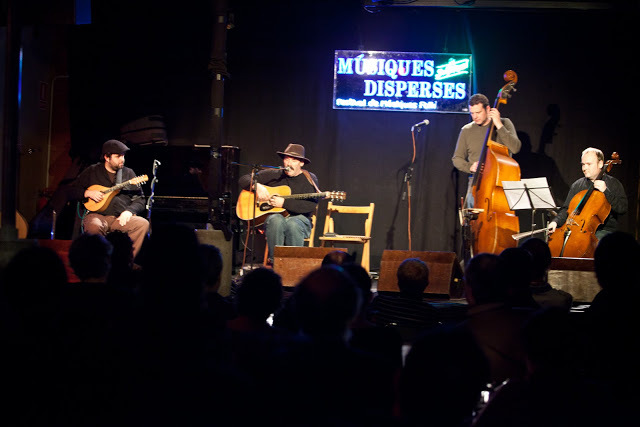 Stephen and Rich did one more performance under the Tree People name at the Musique Disperses Festival in Spain in 2011, on a trip that was a highlight of Stephen's musical life. 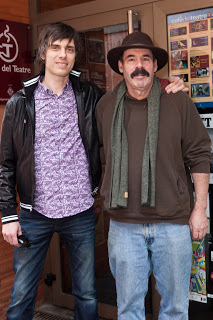 Musical travelers Rich and Stephen in Lleida, Spain. 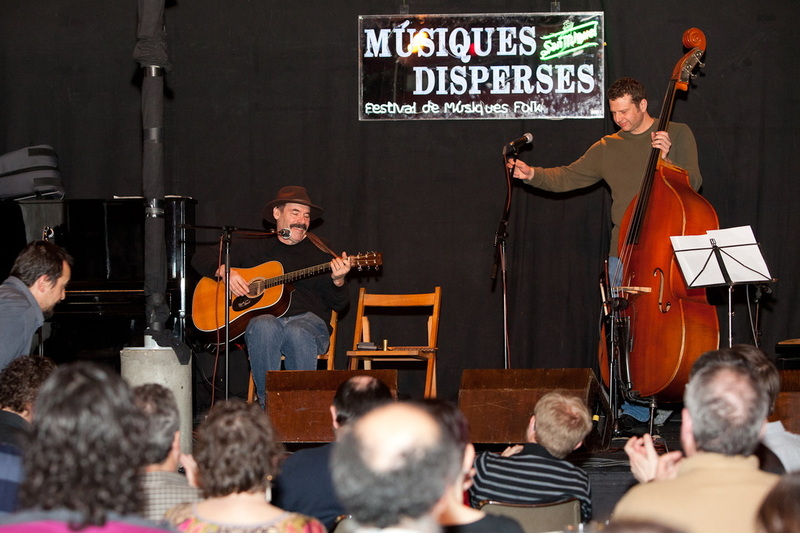 Stephen finally meets Musiques Disperses Festival director and Guessen Records executive Antoni Gorgues in person. 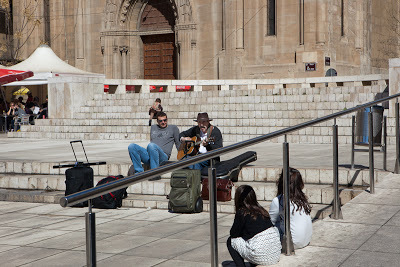 Stephen performs an impromptu concert for the children on the LLeida plaza on the way back to the high speed train. photo by Ben Sussman. 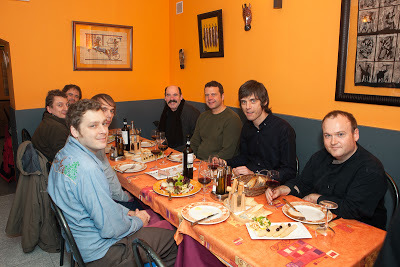 After the noon rehearsal, an afternoon siesta, and a sound check, Antoni took everyone, including Douglas (of Yoga Records, visiting from Los Angeles), Alex of Guerssen Records, the sound man, all the musicians (and our traveling photographer) to dinner. 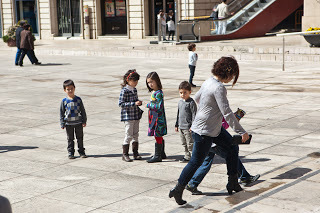 They then made the short walk to the festival site, Cafe del Teatre, ready for the performance. Children in the plaza watching Stephen play. Photographer Ben Sussman joined Stephen and Rich on the trip to Spain, documenting the experience as only Ben can do, with concert photos, travel photos, and even some photos of the fresh, local food they ate along the way. 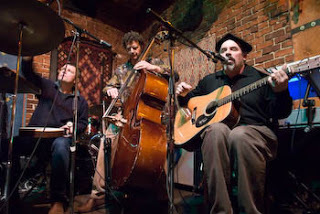 After returning to the Pacific Northwest after their last performance under the Tree People name in Spain, Stephen and Rich became the creative acoustic duo, The Walking Willows, collaborating on Stephen's Cistern Symphony while doing creative residencies at Centrum, doing concerts in Oregon and Washington, musical tours on the East Coast and New Mexico, and recording an album, by hand. Stephen taught himself to play a custom made cigar box guitar, made his own cigar box guitars, and recorded an album, 3 String Stephen Plays Cigar Box Guitar, in 2014. 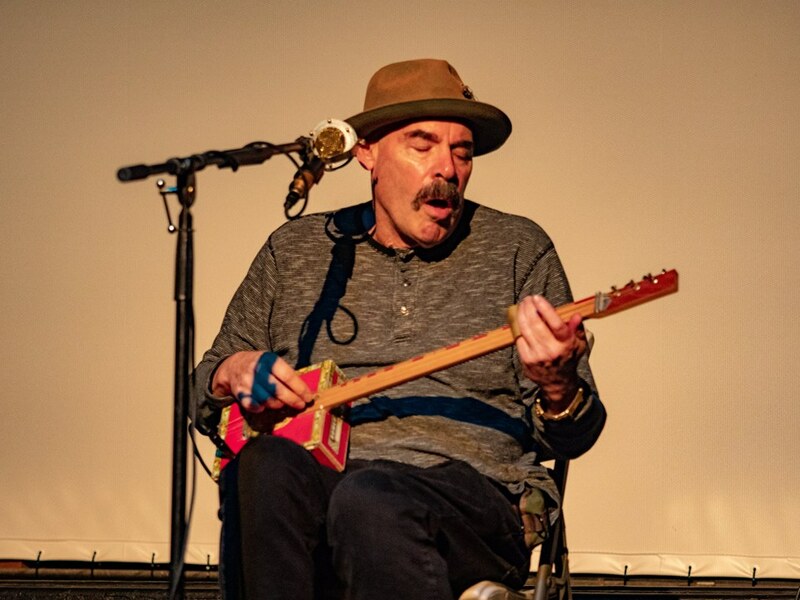 He recorded 7 musical pieces using voice, acoustic guitar, cigar box guitars, a homemade 5 String Thing instrument and a custom made miniature guitar on the theme of talk at his 2015 artist residency at Jack Straw Studios in Seattle. 2017 was a year of residencies for Stephen. He created the String King, a playable 6 foot musical sculpture, which he displayed at the Salem Art Fair, as a Salem (Oregon) Art Association Artist in Residence. He was Music OMI fellow and did a residency with collaborative performances at Art OMI in New York State, with 11 amazing musicians from all over the world. He did a residency at the DeFeniks Center in Mortsel, Belgium, where he made new instruments, did a Cigar Box Guitar workshop, and performed at the Walpurgis Musicktheater. Stephen was a featured Showcase Performer at the SXSW Music Festival in Austin, Texas in March of 2018. He released the vinyl album, Where Do We Go? in the fall of 2018, featuring Stephen singing and playing acoustic guitar, cigar box guitars, a one of a kind custom made miniature guitar, and a homemade 1 String Thing instrument, with guest appearances by pianist Yuan-Chen Li and vocalist Maeve Stier. Stephen thanks all his loved ones, all his extended family, and all his friends and colleagues, for all the love and encouragement over the years. His story would be nothing without them. Stephen playing cigar box guitar at the Clinton Street Theater in Portland.